December is a month to celebrate many things, including International Human Rights Day on December 10th. 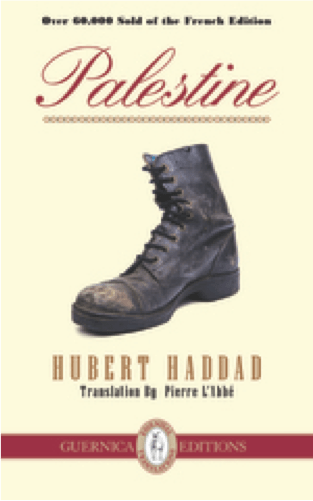 For December we’ve decided to feature Hubert Haddad’s Palestine, translated by Pierre L’Abbé. Palestine calls to attention issues of human rights with strength and compassion – it is no wonder that Le Monde has called it “probably one of the most beautiful books from a writer who takes a stance against his times”. “A flickering of sparks takes the place of his memory. A whirlwind of moons and suns on his lips. Sleep of anguish. The all encompassing night. Apart from the tingling in the tips of his fingers, all feeling leaves him. He does not hear the storm that strikes long after the bombs. An absence does not identify itself, nor take on a shape. A fine blade lands between this moment and the fathomless abyss of nothing. In one stroke nothingness swallows billions of years and randomly churns up a sigh of resurrection” (19). Haddad’s descriptions create the kinds of vivid impressions that leave the reader feeling wary, unsafe, immersed in the tension of the Israel-Palestine conflict. The geography of the region is represented with the kind of detail that a story like this deserves: “The upper hills to the east of Hebron were thick pleats on the neck of a Goliath…To the north, towards the Bekaa Valley, where the southern section of the security fence began, one could make out new work sites for roads reserved for colonists which would connect Harsina to Kiryat Arba” (42). What Palestine does especially well is portray how confusing this geography is, a region whose borders are continually shifting. The confusion between dreams and reality parallels the novel’s representation of how nebulous territories can be in this region, as the novel’s protagonist falls in and out of dreams – somnambulistic states that are more delirious than they are wondrous. Most importantly, Palestine paints a portrait that shows how confusing the Palestine-Israel conflict is. Through his stylistic choices, Haddad insists that this conflict is not simple – it is complicated, multifaceted, and nightmarish. There are so many more sides to the conflict than two: there are pacifists on both sides of the border, innocent bystanders, radicalized fighters who create destruction in the name of both Israel and Palestine. By weaving in an impressive array of Biblical imagery, Haddad shows that there are Goliaths and Good Samaritans on both sides of the conflict. “Everywhere below and on the hills, the darkness studded with lights was subdued by the cold clarity of the stars. From far out in the distance, the call to isha, the evening prayer, rang from one minaret to another. Even louder still, the metallic voice of the television news from the ground floor rose in a hubbub of clanging dishes, sudden laughter and slamming dominoes. An endless inventory of human mystery was strung out like a marine weather bulletin: bloody arrests and raids in Ramallah, more fratricidal combat in Sri Lanka, inter-communal massacres in Iraq…” (96). “’It is not so far away…,’ Falastin said while curling up in the hollow of his chest. ‘What do you mean?’ ‘Nothing. War is never far away’” (96). This December, pick up a copy of Hubert Haddad’s Palestine, a compassionate novel that shows how all humans have rights – and that conflict can only be resolved by appealing to common humanity. Hubert Haddad was born in Tunis and raised in Paris. He has published more than fifty novels, plays, and essays. The original French version of Palestine won the Prix des Cinq Continents de la Francophonie in 2008, and the Prix Renaudot Poche in 2009. Pierre L’Abbé published his first book, Lyon, in 1996. He is also the author of Ten Days in Rio, a novella in verse, Kiss of the Beggar, and he is the translator of Benjamin Fondane’s Exodus. Tagged with Book of the Month, Hubert Haddad, Palestine, Pierre L'Abbe.